OUR BENEFICIARY, Thank you for your support! and learn of their purpose and use throughout Ireland’s history. place at the festival Saturday and Sunday. We thank you for your support. RMIWA is dedicated to education about and rescue of the Irish Wolfhound. 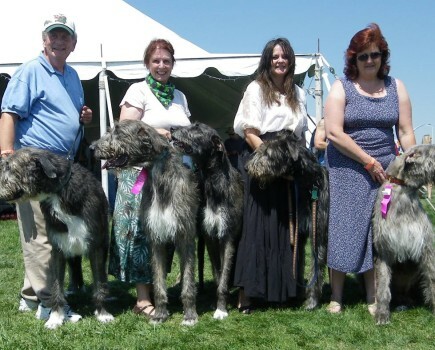 RMIWA is committed to the protection, welfare, and guardianship of the Irish Wolfhound, and to the preservation of our beloved breed as defined by the standard recognized by the American Kennel Club. RMIWA considers education of the public and of our members about Irish wolfhound’s physical and psychological health, training, and medical care throughout the life cycle to be of paramount importance. RMIWA encourages sportsmanlike competition at dog shows, obedience trials, field trials, and matches under the rules of the American Kennel Club and/or the American Sighthound Field Association, as appropriate. RMIWA maintains an active rescue, rehabilitation and placement program for abused, neglected, surrendered, or abandoned Irish Wolfhounds. RMIWA encourages participation in American Kennel Club puppy and canine good citizenship (CGC), companion, service and therapy dog activities. RMIWA shall not be conducted or operated for profit and no part of any profits or remainder or residue from dues or donations to the club shall inure to the benefit of any member or individual.